Are you Canberra or Dalgety? Today’s guest blogger is Stephen Welch, a former President of IABC UK, and currently an independent communication, HR and change consultant. 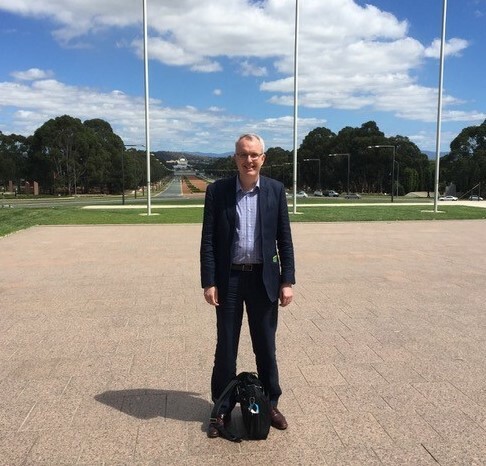 What if the story of Canberra can teach us something about how to succeed as a communicator? Today I had the lovely pleasure of lunching with some colleagues from IABC Canberra and we started talking about how communicators can make an impact beyond their immediate ‘heads-down’ job. What do you need to do be a ‘heads-up’ communicator and move your professional reputation from “great technician” to “strategic adviser”? How do you make an impact? As it happened, I arrived in Canberra on the early morning flight so had a bit of extra time to remind myself of what a nice place it is (my parents used to live in Downer). I ended up at Regatta point, did some work at the café, and even managed to have a look around the National Capital Exhibition and the history of Canberra. Are there any lessons from that Exhibition that we as communicators can apply in our field? Let’s go with ‘yes’ for now otherwise this will be a short blog. I believe there are two. First, I read one exhibit about how a group of senior politicians did a tour of all the potential sites for the new National Capital, going round rural NSW doing research and understanding the terrain and issues. They were literally operating outside the comfort zone of their urban offices, and in some cases their natural expertise zone, to really understand the “problem” and how to solve it. They were doing what was right for Australia (the organization as a whole) rather than what suited them. They could have stayed in their professional sandbox but they didn’t. They were not like the communicators who stay ‘heads-down’ doing their job, staying in the Sydney or Melbourne of their comfort zone and not visiting the Bush of the rest of the business to really understand it and improve their decision-making as a result. Second, I read how the original plan was to transfer 100 square miles of territory to the new ACT, following the model of Washington DC (which was originally 100 square miles). Until someone said, “no, no let’s make it much bigger”, and that’s how it become 910 square miles. DC eat your heart out! Who says communicators have to be limited in scope and scale? We have a much bigger territory to play in than we realise. Expand your horizons. Communicators should be unafraid to stray beyond their originally-allocated 100 square miles show how they deserve much more responsibility. 9.1x as much to be exact. I believe that for many communicators, the trouble is that playing in one’s own professional sandbox is too much fun. It’s great to meet people who have the same challenges, and get excited about the latest developments in your own professional field. And of course one never has any time to meet real customers, read the financial newspapers about competitor movements, invest in research to find out what is really going on. Worse, as you get more senior, you’re no longer judged on your technical skills, you’re judged on your consulting skills. In other words, your internal clients have no way of independently assessing the quality of your technical advice, they can only judge whether you behave and act in such a way that you add value, you act as a counsellor, and whether you demonstrate understanding of their part of their business and their challenges. They don’t care if you can calculate statistical significance, or have a qualification. They want to know: can you add value to my business? If I’m a senior business person, why should I partner with you if you haven’t taken time to understand my part of the business, the key challenges, the promises we’ve made to shareholders, etc? If I’m a senior business person, why should I partner with you if you don’t demonstrate consulting skills, invest in relationship-building, link your solutions to my problems, and articulate quickly how you are going to add value? Unless you go exploring in the Bush you will never know the real challenges of the business. And unless you have business partnering skills, you will never persuade someone that you deserve 9.1x the territory you were originally assigned. What’s really surprising, though, it that there is far less mystery about these skills than you might imagine. These skills and tools are teachable and learnable. Sure, you won’t be fluent the first time but once you learn how to apply the tools you can become a strategic adviser to senior leaders and make that impact. I work in the UK and we have developed training courses which include business simulations, consulting tools and coaching to help address these issues. We’ve worked with the UK Government Communications Service to develop training for their communicators and this content is also part of the Master’s in PR programme at at London university. And you can learn them too. At the recent IABC World Conference in Montréal, the pre-conference workshop was all about becoming a strategic adviser and making an impact. So this is your chance to make an impact on your clients, your company, and your career. You learn these skills and become big Canberra, with expanded horizons making an impact on the big stage. Or you do nothing and end up like tiny Dalgety: once tipped for greatness and the top job in Australia Ltd, but now a forgotten rural village. I ask again: are you Canberra or Dalgety? Connect with Stephen on LinkedIn.